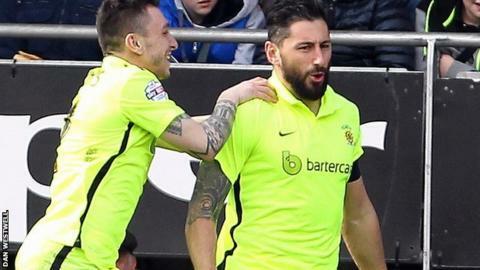 Hartlepool stretched their unbeaten run to six games with victory at play-off hopefuls Leyton Orient. Billy Paynter gave the visitors the lead after the break when he converted Jake Carroll's cross at the back post. Nathan Thomas made it 2-0 when he drifted in from the right and drilled a low shot past Alex Cisak. The O's, beaten twice over the Easter holiday, tried to get back into it, but visiting keeper Trevor Carson denied Jay Simpson and Blair Turgott. They remain eighth in League Two, two points outside the play-off places, while Hartlepool's win moved them up to 17th. Match ends, Leyton Orient 0, Hartlepool United 2. Second Half ends, Leyton Orient 0, Hartlepool United 2. Sean Clohessy (Leyton Orient) wins a free kick on the left wing. Michael Woods (Hartlepool United) wins a free kick in the defensive half. Attempt missed. Jay Simpson (Leyton Orient) left footed shot from the right side of the box is close, but misses to the right. Attempt saved. Michael Woods (Hartlepool United) right footed shot from the centre of the box is saved in the bottom right corner. Foul by Michael Woods (Hartlepool United). Attempt saved. Jay Simpson (Leyton Orient) right footed shot from the centre of the box is saved in the top centre of the goal. Substitution, Hartlepool United. Rakish Bingham replaces Luke James because of an injury. Attempt saved. Sean Clohessy (Leyton Orient) right footed shot from the right side of the box is saved in the top centre of the goal. Substitution, Hartlepool United. Brad Walker replaces Jake Gray. Blair Turgott (Leyton Orient) wins a free kick in the defensive half. Attempt saved. Ollie Palmer (Leyton Orient) header from the right side of the box is saved in the top centre of the goal. Corner, Leyton Orient. Conceded by Trevor Carson. Attempt saved. Blair Turgott (Leyton Orient) header from the centre of the box is saved in the top left corner. Attempt blocked. Ollie Palmer (Leyton Orient) header from very close range is blocked. Corner, Leyton Orient. Conceded by Matthew Bates. Substitution, Hartlepool United. Michael Woods replaces Lewis Hawkins. Attempt missed. Nathan Thomas (Hartlepool United) left footed shot from outside the box is too high. Substitution, Leyton Orient. Lloyd James replaces Jack Payne. Corner, Hartlepool United. Conceded by Alex Cisak. Attempt saved. Lewis Hawkins (Hartlepool United) right footed shot from outside the box is saved in the top right corner. Attempt missed. Peter Ramage (Leyton Orient) header from the centre of the box is close, but misses to the right. Attempt blocked. Jay Simpson (Leyton Orient) left footed shot from the centre of the box is blocked. Goal! Leyton Orient 0, Hartlepool United 2. Nathan Thomas (Hartlepool United) left footed shot from the right side of the box to the centre of the goal. Peter Ramage (Leyton Orient) wins a free kick in the defensive half. Sean Clohessy (Leyton Orient) wins a free kick in the attacking half. Foul by Nathan Thomas (Hartlepool United). Substitution, Leyton Orient. Frazer Shaw replaces Kevin Nolan. Substitution, Leyton Orient. Blair Turgott replaces Armand Gnanduillet. Lewis Hawkins (Hartlepool United) wins a free kick in the attacking half. Attempt missed. Luke James (Hartlepool United) header from the centre of the box is close, but misses the top left corner.